You've come to the right place. Growing potatoes requires a bit of preparation and maintenance throughout the growing season. They require a light, airy soil and need to be tended to every couple of weeks. Potatoes are usually reserved for traditional vegetable gardens. Although it's possible, they are generally not grown in containers. It is becoming more popular to grow potatoes in sacks, but we haven't personally tried this method. Potatoes are usually ready for harvest 90-125 days after planting, depending on the variety and the size you want them to be. Potatoes are a cool season crop that don't do well in hot weather. They grow best when temps are in the 60-80 degrees F range, although they will tolerate the occasional fluctuation outside this range. The soil should be at least 45 degrees F before planting potatoes. Potatoes come in a wide variety of colors and sizes and they can be red, yellow, white or even purple in color. 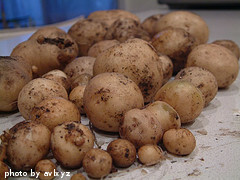 They can be harvested early for "new" potatoes, or left in the ground to reach their maximum size. After harvesting, they can be eaten immediately or stored, canned or frozen for later use. 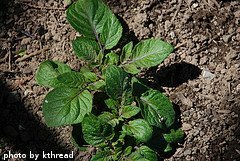 Potatoes are planted in the garden using seed potatoes. These are basically mini-potatoes that have 1-2 eyes. Seed potatoes are available at most garden centers. You should choose only certified seed potatoes because they have been specifically selected to be disease-resistant. Growing potatoes from certified seed potatoes will also, more than likely, produce a larger crop. Theoretically, you could purchase a regular potato from the grocery store, cut it up into pieces, plant it, and be able to grow potatoes. However, these commercially produced potatoes have been chemically treated to prevent them from sprouting. They are also more susceptible to various potato diseases. You'll have much better results if you purchase and plant only certified seed potatoes. After purchasing seed potatoes and approximately 2 weeks before planting them, you should set the tubers with the eyes facing up in a warm (65+ degrees) location that gets lots of sunshine. Spray them with water every other day. They should begin to sprout within a week. 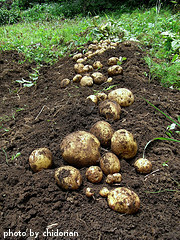 Click on the following links to learn more about growing potatoes.